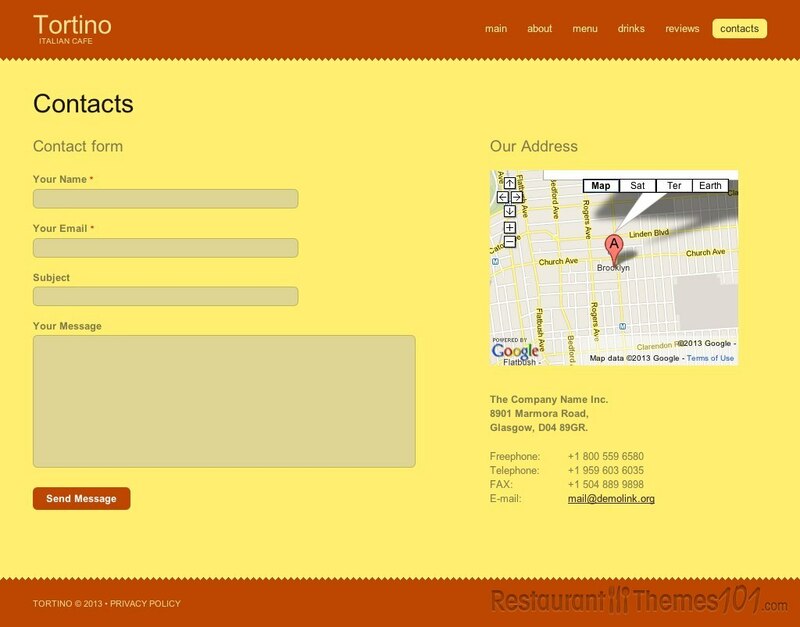 Tortino is a WordPress restaurant theme, but it is very adjustable so it can work just as well as a WordPress cafe theme. It was created by Cowboy and it is presented at Template Monster. Tortino has a modern looking layout with a nice color scheme. The colors prevailing are yellow and brown; this is a very light theme that looks very positive and cheerful. The homepage is enhanced by a featured slider, which is wide and containing photos of delicious food, it results as the perfect eye catcher for your visitors. Along with a photo, you can add a short description of the dish shown, and by clicking the description your visitors will be taken to a page where they can read all about it. The “about” section is reserved for a post about your restaurant/cafe, presenting your team, recent news and today’s specials. 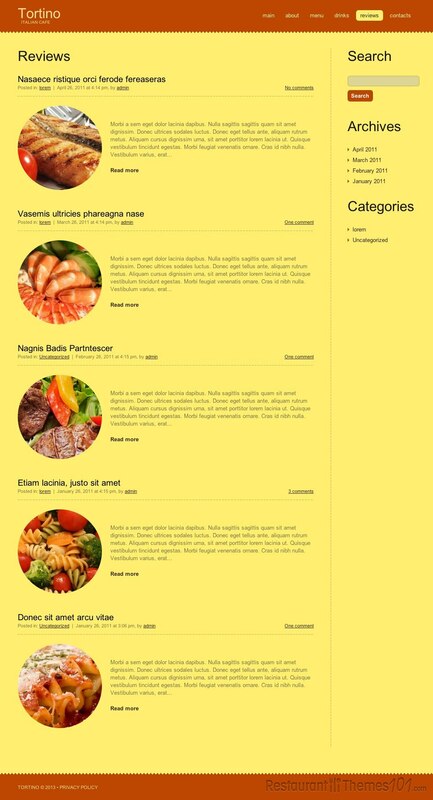 The menu is very easy to create and categorize, you will be able to create it in 3 different categories, which will make it very easy for your visitors to quickly find the dish they are looking for. There is also a separate menu for your drinks so they don’t have to snoop around the website for hours in order to find them. The reviews section is there for you to post testimonials of your satisfied customers and present them to your visitors so they can see what other people think of your restaurant. The contact section offers Google Maps integration so you can be sure anyone can find the exact location of your restaurant very quickly and easily. Back to the homepage, you will be able to present your today’s menu along with photos of your dishes and small intros. 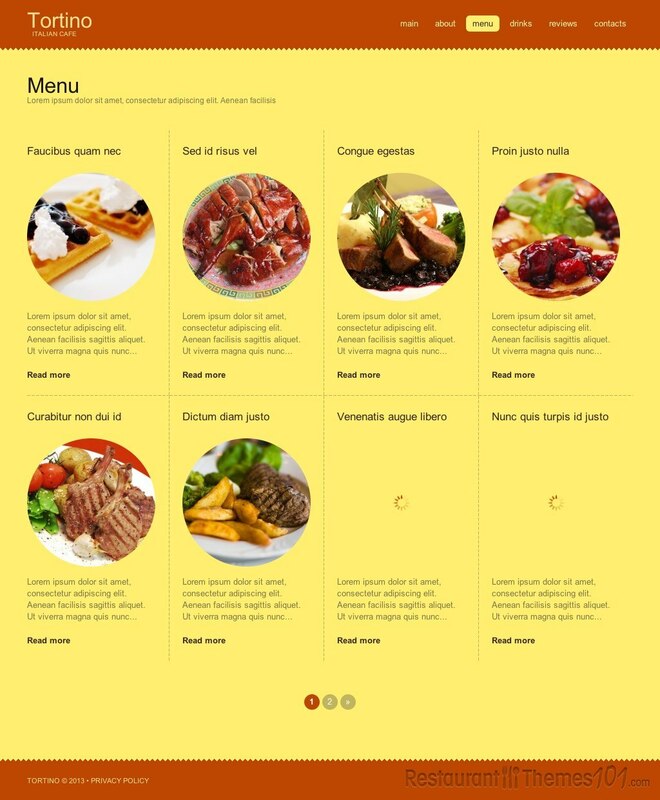 By clicking them, your visitors will be lead to a page where they can see a full description of the delicacy presented. Tortino has a great easily run control panel and it comes with installation and setup instructions.